Nip around the corner from the Elephant & Castle and walk on farther south where the air’s a little calmer, and before you know it, you’ll have arrived at the Threadneedleman, an unassuming shop caught in the crook of the road’s arm. On the walls hang the framed photographs of stars who have rung the bell and stepped into this little shop on the Walworth Road in search of bespoke tailoring precision. Paintings by local artist Ed Gray occupy wall space above the swatch and sketch books, rolls of English cloth, ties (Peckham Rye, of course) measuring tapes and chalk. And against the wall runs the long rail which bows with the weight of garments in varying states of completion. There may be just enough room to swing a cat, but George Dyer has retained his hard-won cachet by staying put and not moving to larger premises, for his is no ordinary clientele base. 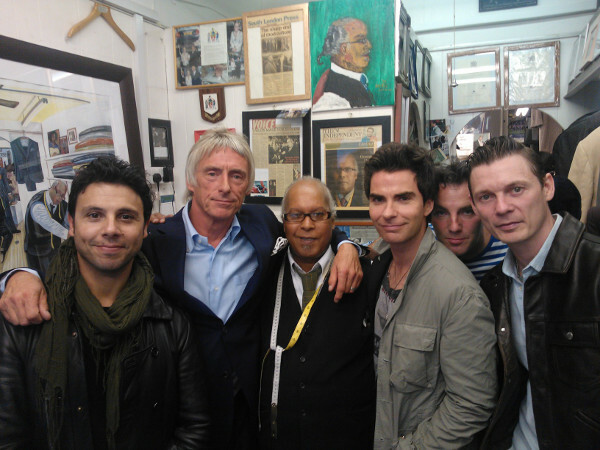 Suits worn by Suggs, David Haye, Martin Freeman, Johnny Harris, Robert Elms, Paul Weller and Kelly Jones (pictured above with George) have all been measured, cut and made in this bijou establishment. The shop is a hideaway from the West End, with local folk and big names from the entertainment world heading south of the river for coffee and chat. The signature cut offered by George comprises subtle differences in a suit’s focal points; the pockets, cuffs, lapels, vents and button holes. It’s a razor sharp look that can intimidate with something the writer Jake Arnott calls ‘decorative violence’. But it’s been a long road to reach this moment of synthesis. ‘My dad was a trouser maker when he came here from Jamaica in 1959,’ he says, ‘and he was intent I should receive a good education. I did my schooling at Peckham Manor which I left just before my seventeenth birthday. Then, in 1973, I got an interview in a tailor’s shop in Fleet Street called Dombey & Sons. I went there in my finery. 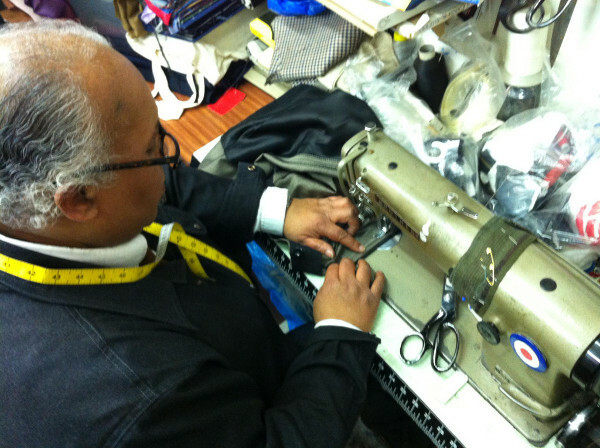 In those days tailors were called Mister, so the cutter and fitter was Mr Dennis. After a week of chores, Mr Dennis gave George a brush and told him to go through all the off-the-peg stock and brush them down and sleeve them. Here began his apprenticeship, the bedrock of many a great career. After three years, George received his City and Guilds in craft tailoring. For 12 years he worked for Dombey & Sons all over London, but when made redundant, went into business in a tailor’s shop in Peckham with his friend Jimmy Nash.